Peter Stelmacovich | Deafened But Not Silent. I am a man wearing many hats. Trained as an audiologist, I currently am the Director of Pediatric Sales for Phonak Canada. I also wear a cochlear implant in one ear, a hearing aid in the other, and of course use Phonak FM systems every day. Finally, I am an active musician playing bass guitar in various groups. I have not been blogging for a while, but have not stopped writing. 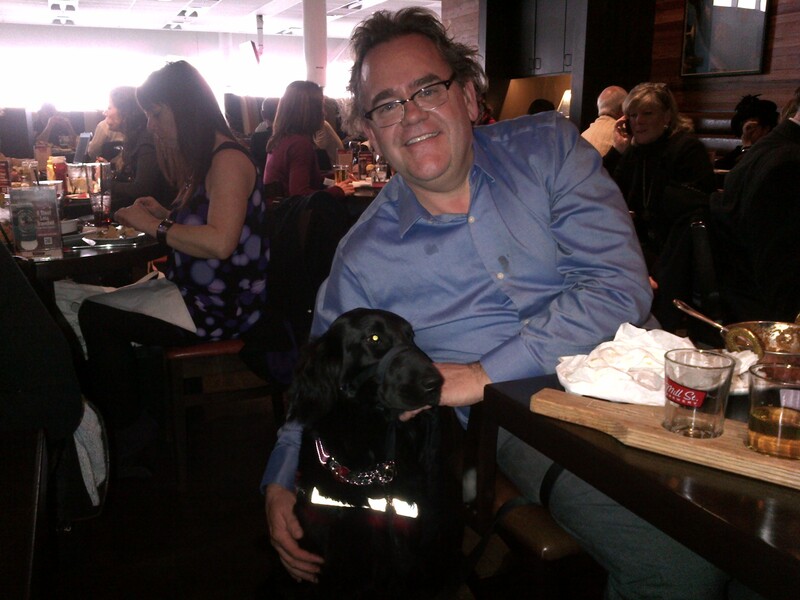 I now have a regular column in the “Canadian Audiologist”. This is the on-line publication for the Canadian Audiology Association. I found that it was hard to write quality pieces for both the blog and the magazine. The audiences for these two are quite different however. 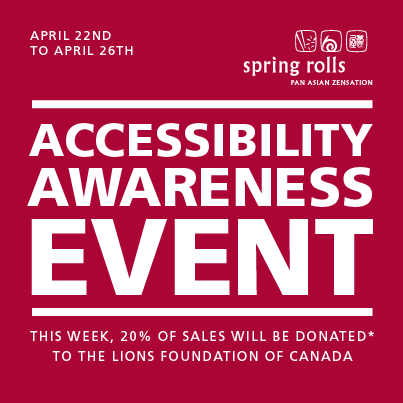 The blog was read more so by people with hearing loss and their families, while the magazine was targeted for professionals. So I will attempt to provide material for both, recognizing the two different audiences. So stay tuned for some more material! Really, me? Stuck up?? A snob?? Why did she say that? Ahhh. Could it be I just didn’t hear her? This got me thinking about some of the funny or unusual things people with hearing loss sometimes do. Most people would not connect that these behaviors are in fact related to our hearing loss. Below is a list of some of the weird things people with hearing loss do, why we do it, and how we can make it better. Ignore People. This is the example above. Likely what happened to me is that the environment was noisy and I didn’t hear my name in all the racket. Alternatively, the person could have been on my left side, which is my non-implanted ear. I don’t hear much on that side even in quiet. Or my batteries might have been dead. Or maybe I just wanted to enjoy some peace and quiet and turned everything off. What to do about it: First off, anyone that knows me, knows I am a very social person who never snub anyone. Don’t take offense. Try to get my attention visually or by tapping me on the shoulder. Close Proximity: I do not do this too often, but I have seen others with hearing loss do this. Since we can’t hear well, especially in background noise, we sometimes invade one’s social space try to get closer to the sound source, in this case the talker. What to do about it. First off, this behavior is most likely exhibited by people who do not get amplification to assist with the hearing loss. Get proper hearing aids and assistive listening technology for noise and you won’t have to do this anymore. Forgetting Names. Actually, I am not sure I am forgetting people’s names, but rather I never heard it correctly in the first place. The reason we have such a hard time with names is that there is no linguistic context to assist us. For example, if some said “Please pass the salt and _______”, we know that the most likely final word is pepper. But if someone says, “Hello my name is ______”, it could be anything. Other times, I may have misheard the name and called someone the wrong name. Eg, Norma instead of Nadia. Hearing, learning, and remembering names is brutal for people with hearing loss. What to do about it. Well use a wireless system that gets rid of noise. So in a noisy social situation, you have a better chance of hearing the name correctly. I also use a buddy system with my wife who has normal hearing. She fills me in with the names after the introductions. I also have a cue for my wife when introducing her to someone whose name I ought to know. For example, if I do not now the name of a person I really ought to know, I turn to my wife and say “Have you two met yet”. She then promptly extends her hand and says “Hello my name is Kim”. Other person reciprocates. Problem solved. Knock Over Drinks at Dinner Table. How on earth could this be related to hearing loss you ask? Simple. I am busy listening to someone across the table. It is a noisy restaurant. So now I have to rely more on lipreading cues for communication. I am staring at the person’s lips, reach for my beverage without properly looking, and then knock it over. What to do about it. Don’t reach for the beverage while trying to listen. Use a wireless system to get rid of noise. Bump Into Things/Scratch Up My Watch. This is very similar to the above scenario. If I am walking down the street with someone I am looking at their face face to lipread. 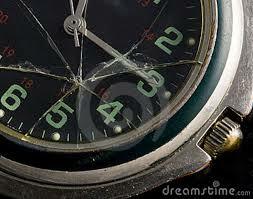 Since I am not paying attention to what’s in front of me, I bash my watch into walls and posts. Sometimes I crash into people. What to do about it. Buy cheap watches. Apologize profusely to people I bump into. And again, use a wireless system to get rid of the noise. Speaking Too Loud. This one is more obvious. 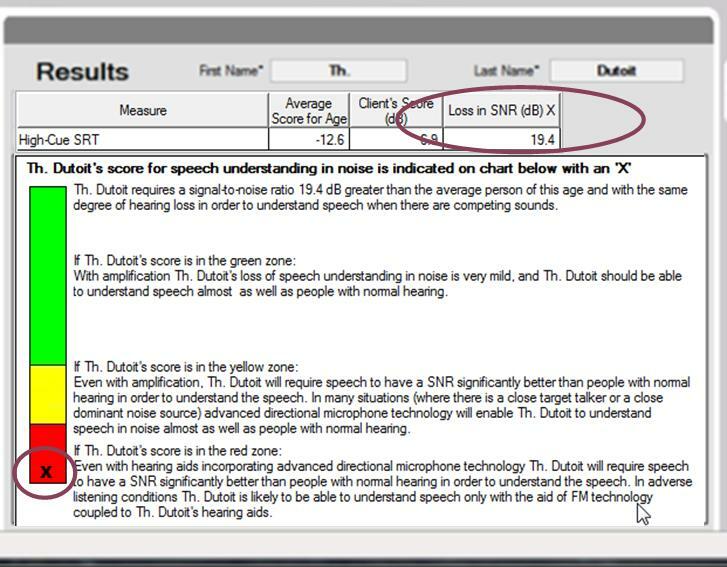 Folks with hearing loss routinely have trouble monitoring their vocal intensity. And it gets worse when in noisier environments where it is harder to hear oneself or others. What to do about it. This behavior is also more typical in people who do not have personal hearing aids yet. Get some! Speaking Too Soft. This is more common for me. I do this for a number of reasons. First, I am scared that I am speaking too loud and so I overcompensate. Secondly, I do have a tendency to overestimate the hearing capabilities of normal hearing people. I think you can hear a whisper from across a room. What to do about it. I carefully watch the faces of people I am speaking with. If it looks like they are straining to hear me, I speak up. If their eyes widen and they push back from the table, I am likely speaking too loud. Lastly, I inform close friends and family to let me know if I am too loud or too soft. Inconsistent Hearing Behaviors. Sometimes I hear you, sometimes I don’t. What’s up with that? Guy must be faking it. Actually, no. The inconsistencies are likely due to varying noise levels. Sure in a face to face situation in a quiet room I hear pretty well. BUT THE WORLD IS REALLY NOISY PLACE. I would say that I find myself in a ideal listening environment at best about 10% of the time. The other 90% of the time, the noise levels severely impact my ability to communicate. What to do about it: This is why I have been using my wireless FM system so diligently. I cannot imagine how I could function without this technology. So there you have it. Some weird behaviors that are in fact related to hearing. I am sure there are other examples. So please share your stories, I would love to hear about them. How Do You Know You Need a Wireless Microphone? But how do you know what technology you need? This is a very important question that needs to be answered right away before you decide what kind of hearing devices you wish to purchase. Let’s say you need Dynamic Wireless system in addition to hearing aids. If you have sufficient financial resources at your disposal, you may wish to purchase a premium hearing and a wireless system. This is the best of all worlds. But if you have limited resources, you may wish to spend less money on your hearing aids in order to have enough money left over for a wireless system. It is also important to know this in order to have realistic expectations about your hearing instruments. If your hearing loss requires that you use a wireless microphone system in order to hear in a noisy environment, you can do countless hours of hearing aid fine tuning with your Hearing Care Professional and you are still not going to hear better in noise. Its simple physics: a Dynamic Wireless microphone placed in close proximity to a speaker’s mouth will always outperform a microphone at the ear level. Experience with Existing Hearing Devices. If you already have hearing aids or a CI equipped with directional microphones and you are still struggling to hear better in a noisy environment, you will have answered your question about the need for a wireless system. Experience with a Bluetooth Wireless Microphone. 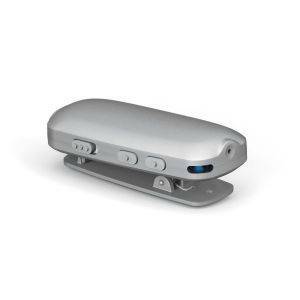 As I mentioned in my previous blog posting, a Bluetooth Wireless Microphone will provide better performance than a directional microphone on your hearing devices. But if you are still struggling with the Bluetooth mic, there are still significant improvements that can be obtained with a Dynamic Wireless System. The microphones cut noise better, and the dynamic nature of the system will reduce the amount of noise your hearing aid or CI microphones will pick up. Experience with a Fixed Gain Wireless System. Similar to the above, if you already have tried a fixed gain system (Eg Phonak Campus, SmartLink SX, ZoomLink or EasyLink; Oticon Amigo, Comfort Audio Digisystem) and are still having trouble, then a Dynamic System will provide additional benefits particularly at noise levels at around 70 dB or greater. This is about the level of a restaurant. Audiogram Approach. Most people with moderate-severe hearing loss or greater will require more than a directional microphone on the hearing instruments. Direct Assessment of Hearing in Noise Abilities. There are several tests that your Hearing Care Professional can perform to help determine right away what kind of technology you need. The one I am most familiar with is the LiSN-S PGA test and as such I will highlight this test in the remainder of this blog posting. LiSN-S PGA stands for Listening in Spatialized Noise. Performed under headphones, a virtual 3D space is created with target sentences coming from the front and distracting sentences are coming from the left and the right. The PGA stands Prescribed Gain Amplifier. The stimuli are amplified according your hearing test results. So it simulates the way you would hear in a noisy environment if you had hearing aids and an omni-directional microphone. LiSN-S PGA accurately measures your ability to understand speech in noise as if you were wearing hearing instruments (amplification), and by your performance on LiSN-S PGA with normative data stored in the software, LiSN-S PGA predicts accurately the your performance in noisy situations compared to normal hearing listeners of the same age, and if the predicted performance is not good, LiSN-S PGA gives you clear, individual, technology recommendations how to improve speech understanding in noise. So based on your responses to the sentences, you get an evidence based recommendation. The test takes about 5 minutes to perform. You will hear noise first coming into both ears. It will seem like the noise is coming from the sides. Then you will hear a sentence that sounds like it is coming from in front of you. Your task is simply to repeat back the sentence. Your Hearing Care Professional simply needs to click on how many words you repeated correctly. 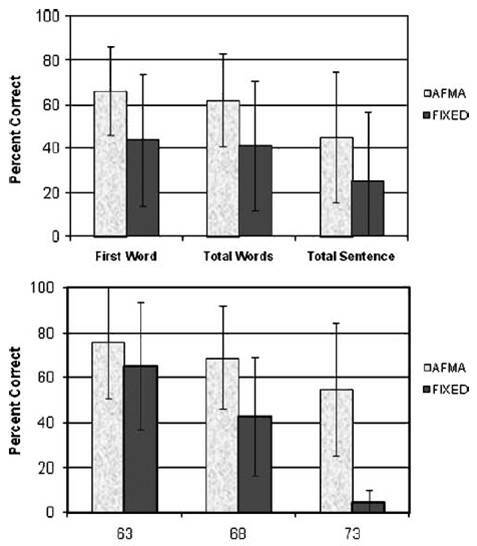 The computer will then automatically make the next sentence softer or louder depending on how well you did. The test stops when the software has sufficient results to make a recommendation for you. Personally I find it interesting that difficulty hearing in noise is one of the most common complaints that a person reports when getting a hearing test, yet most hearing care professionals never assess this. Far too often we wait for a patient to fail with the hearing devices before we explore additional noise reduction technologies. This is unacceptable. 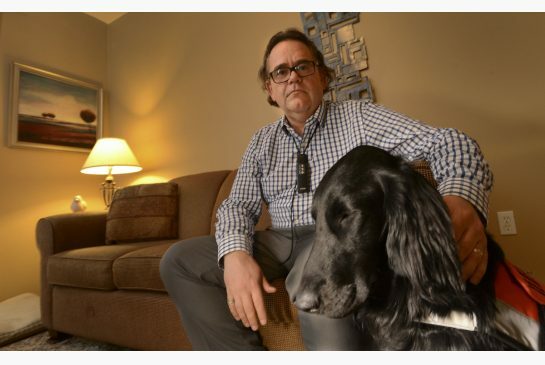 Why frustrate people with hearing loss unnecessarily? I know many Hearing Care Professionals are thinking, “Yes Peter, but many patients won’t use additional microphones, so I don’t bother introducing this technology”. This thinking is also unacceptable. You are making a pre-determination and denying people hearing loss technology that is critical to helping them function in our noisy world. Our duty, as Hearing care Professionals is to help people with hearing loss make an informed decision. Yes, some may reject such technologies initially, but it is still their right to be informed. For more information about the LiSN-S PGA, click here. 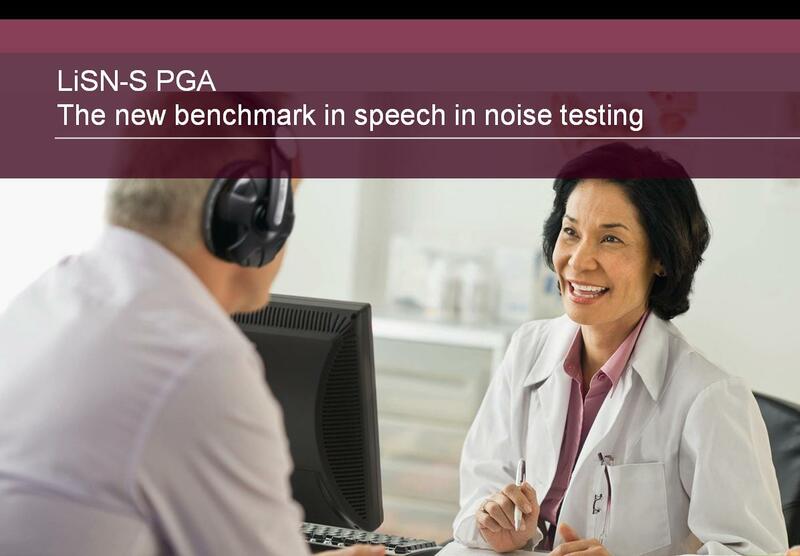 For more information about the development of the LiSN-S PGA test click this link here. 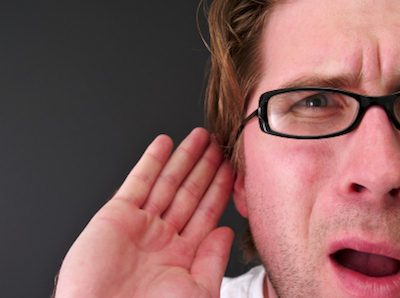 Hearing loss results in two main problems; loss of audibility and loss of clarity in noise. Loss of Audibility. This means that sounds are too soft to hear. We have a couple of strategies to make sounds more audible. Amplification. Today’s modern hearing aids selectively make softer sounds louder than louder sounds. Frequency Compression. In some hearing aids such as the ones provided by my company, Phonak, the hearing aid can shift high pitched sounds down to lower pitches. The logic is that you may have too much damage in the high pitches to amplify the sounds sufficiently, so we will shift these sounds to regions where you have better hearing. Cochlear Implants. If high powered hearing aids equipped with frequency compression no longer helps you hear, we now turn to a Cochlear Implant to make sound audible. See these links for more information of Cochlear Implants. Also here. Loss of Clarity in Noise. I wish that hearing loss was merely a problem of loss of audibility. It would be so much easier just to amplify the sounds and be done with it. Just like wearing a pair of corrective lenses for vision, right? Wrong. After we do our best to make sound audible, we also have to do something about getting rid of the background noise. As one’s hearing loss gets worse, not only do we need stronger and stronger hearing aids, but we also need to get rid of more and more noise. For example, a person with normal hearing can handle a signal-to-noise (SNR) ratio of 0 and still understand most of what is being said. An SNR of 0 means that the person talking to you is the same loudness as the person you don’t want to listen to. This happens all the time. Imagine a restaurant. There are people all around you talking at the same loudness as your significant other across from you. You normal hearing folks can handle this, people with hearing loss cannot. Strategies to Hear Better in Noise. These 4 strategies are not all the same. They vary significantly in the amount of noise reduction provided. A directional microphone works by picking up the sound from one direction (typically the front) but not from anywhere else. So now you won’t hear the annoying kid in the restaurant behind you as much. Independent research has shown that a directional microphone on the hearing aid does help you hear better in noise compared to a regular omni directional microphone. The range of improvement found in these studies is anywhere from 3 to 8 dB. So it gets rid of about 5 dB of noise. This is not huge, but for people with milder losses of hearing, this may be all they need. It certainly is convenient. You don’t need to carry extra equipment. In fact, in today’s modern hearing aids such as Phonak Bolero Q or Virto Q, these microphones get switched on automatically when it gets noisy. Pretty awesome technology in there. Many companies, including the one I work for, now have affordable Bluetooth microphones that can be used with your hearing aids. You clip this microphone onto the person you want to hear and it transmits wireless via Bluetooth radio waves to a device around your neck which in turn sends it to your hearing aids. By moving a microphone from the ear level to a much closer proximity to the talker’s mouth, we can achieve much higher signal-to-noise ratios than a directional microphone located on your head. Here is the example from Phonak which involves the use of the Remote Microphone in conjunction with either a ComPilot or an iCom. The advantage of Bluetooth microphones are that you get rid of more noise compared to ear level directional microphones. They are convenient, and easy to use with simple and intuitive controls (just an on/off switch and volume). Finally they have the advantage of low cost. It is a very affordable solution, much less than FM. These are all examples of fixed gain systems and achieve similar results. The reason these perform a bit better than the Bluetooth microphones is that most incorporate directional microphones on the transmitters and therefore can get rid of more noise. Additional benefits include greater operating ranges and longer battery life. However, cost is significantly higher for what is really just a modest improvement over a lower cost Bluetooth microphone system. How Do These Technologies Compare? 1. Directional Microphones vs Fixed Gain FM. This classic study by Valente et al in 2002 compares an omni mic to a directional mic on a hearing aid which in turn compares this to an FM system. The data is backwards, so the lower the number, the better the result. 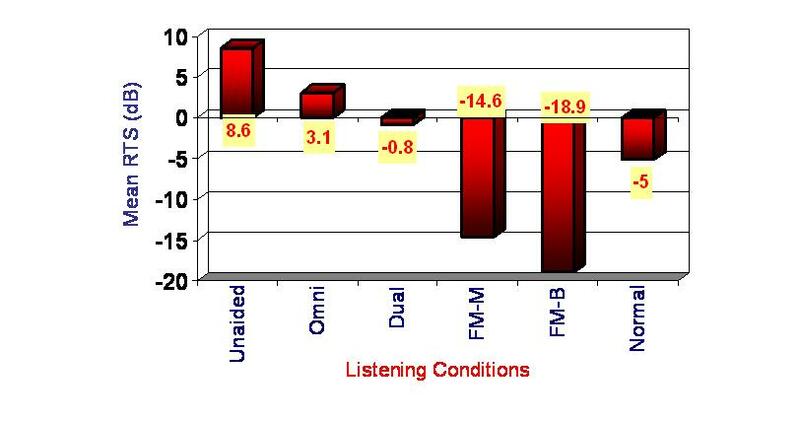 It is very powerful data showing how well an FM system can help over just an ear level directional microphone. 2. Fixed Gain vs Adaptive Gain Wireless Systems. The most extensive study comparing fixed gain vs adaptive gain wireless systems was conducted by Dr. Linda Thibodeau, PhD, University of Texas at Dallas, USA, and the Callier Centre for Communication Disorders, Dallas. AFMA refers to the Adaptive Gain FM while Fixed of course refers to fixed gain wireless less. Remember that fixed gain wireless systems include Bluetooth microphones, Phonak’s second generation FM (Campus), Oticon Amigo, and Comfort Audio DigiSystem to name a few. 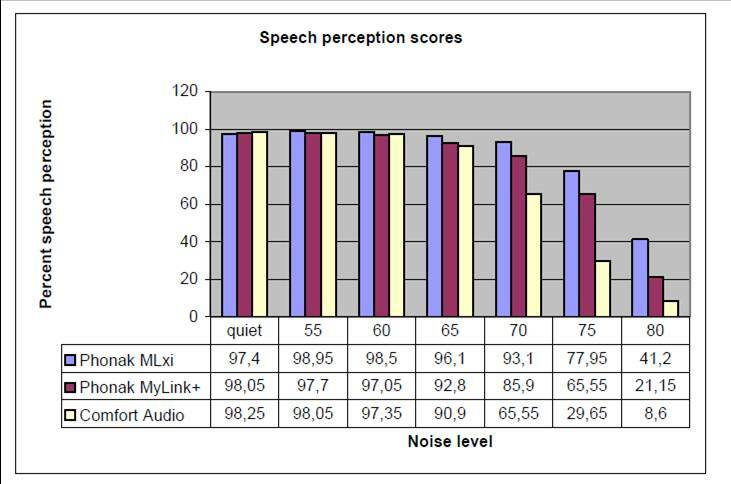 As you can see, when the room noise gets louder, the word recognition score for the adaptive gain wireless system is much higher. In this example, the transmitter used was the Phonak inspiro with Dynamic FM. 3. Adaptive FM vs Digital Wireless. This study, conducted at the University of Orebro in Sweden, compared a digital wireless system with fixed gain (Comfort Audio Digisystem) to a adaptive gain FM system (Phonak Dynamic FM). The question is what leads to better performance in noise. The result s clearly showed that the adaptive gain system (Phonak Dynamic FM) leads to better performance. So which do you need? I will make my next blog post on how to select the correct technology for your needs. But here are the summary points. You need technology that helps you not only hear soft sounds, but also helps get rid of background noise. Directional microphones on the hearing aid itself can get rid of about 5 dB of noise. Bluetooth microphones provide additional improvement in noise. Fixed gain wireless systems such Phonak’s second generation FM, Oticon Amigo and Comfort Audio Digisystem provide additional improvements over a Bluetooth microphone, but these may be modest improvements. Adaptive gain wireless systems such as Phonak Dynamic FM still provides the largest amount of noise reduction. Flora is getting ready for her first flight. She has been an Angel so far. I LOVE this doggie!! !